Irish strawberries are in season, and here’s a real crowd-pleaser for a garden party. I tried it out on some very willing friends this last weekend! Make the meringue recipe, and using a piping bag (or a plastic bag – cut a 1/2″ hole in the corner) pipe the meringues into mini nests about 2 inches in diameter. Bake as per recipe. 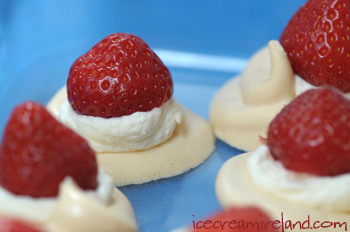 Once the meringues are cooked, allow to cool, then add a small dollop of cream to each meringue. Hull the strawberries, and push them into the cream (cut the larger ones into halves or quarters). Serve, and watch them disappear! They are lovely! 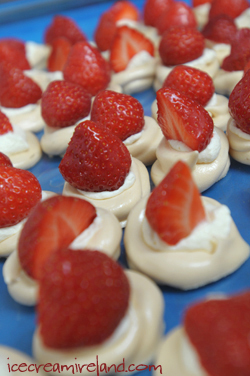 Thinking of things to serve at our informal wedding next summer – they would be perfect! Great blog! Mmmmm, good golly those are pretty.